Texas Time Travel Tours, the mobile app created by the Texas Historical Commission, is a true portrait of Texas. The app features over 550 sites, 170 of which are highlighted with audio and video. Currently there are seven statewide tours in the app and one site-specific tour for THC historic property Fulton Mansion. Points of interest cover the entire state, from Amarillo to Brownsville, to Texarkana to El Paso. The primary goal for the app is to inspire people to travel Texas and specifically historic sites, whether that is a historic fort or a downtown district. Q. Why did the Texas Historical Commission decide to create an app? A. Our team had been considering the development of a mobile app for some time. We traditionally have created travel guides in a print format, but not only is it quite expensive, it limits the content we can include. In addition to broadening our user demographic by introducing Texas history on a mobile device, we also wanted to broaden our storytelling capacity to drive visitation to communities across the state. The THC’s motto is “real places telling real stories”—what better way than to encourage travel to those places? Q. What are the benefits for visitors to use the app? 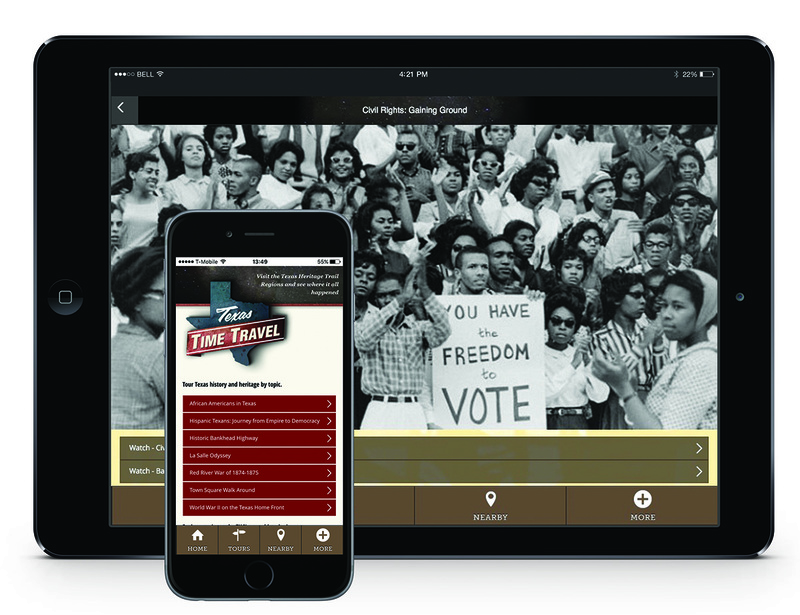 A. Accessing the stories of Texas using the app allows the user to have information at the ready on their personal device, whether they are traveling to a location or simply viewing from the comfort of home. Once the full native app format is complete with individual tour download capability, users will have more complete access to points of interest in areas of the state that are quite remote and have limited cell/wifi connectivity. As mentioned earlier, the app allows for rich visual storytelling with the inclusion of image galleries and video, something not possible using print formats. We have lots of stories to tell! The app’s capacity to house multiple tours gives users access to all of it with just a click or a swipe. Users can also quickly know what places are close to them by using the Nearby map that shows points of interest for all tours. Q. How did the THC team go about planning such a large project? A. Planning began about a year before the initial RFP was issued. We researched other apps for excellence in both storytelling and user experience, and developed a strong vision for our end product. While we had a long list of functions we would like to have in the app, we also realized that the costs of having a platform custom developed for our project probably didn’t meet the long term ROI. We found that already established platforms like the one offered by OnCell could meet our needs with some customization. Q. Can you tell us a little about how the content was created for the tours? A. Most of the initial tours built upon existing agency print guides or guides under development. These guides served as the foundational material to help define the scope of each tour. We established small groups of subject matter experts and advisory stakeholders to work with the staff development team. We contracted external vendors for scriptwriting and video production services. Q. Can you tell us about your marketing strategy for the app? A. Much of our publicity is tied to the THC’s social media channels–Facebook, Twitter, YouTube, and blog posts. Videos from all of the tours are included on our YouTube channel and descriptively tied to the app. This also makes it easier to embed in posts on other channels like Facebook. We experience very high engagement on Facebook when video stories are included in posts about the different tours on the app. Launches for individual tours are tied to related external events when practical. For example, La Salle Odyssey launch corresponded to the opening of a new permanent installation of the reconstructed ship, La Belle, in a major museum. Hispanic Texas launched during National Hispanic Heritage Month. Each tour provides many storytelling opportunities, and will make it easy for us to continue promotions throughout the year with little or no content repetition. All of these contain language that directs user to the full app experience. Q. What advice would you give to other organizations who are looking to create an app? A. Do your research and ask questions for both platform selection and content development. Keep your audience top-of-mind and be consistent in the style and quality of all elements of the project.